Product #20666 | SKU 02380R-0000-110 | 0.0 (no ratings yet) Thanks for your rating! 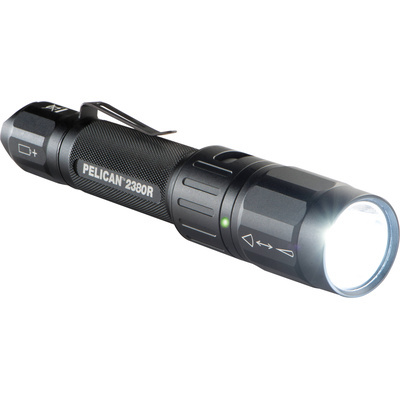 Whether you need a tight, focused beam or a wide flood of light, the 2380 Micro-USB Rechargeable LED Flashlight from Pelican will get the job done. Using a patented reflector design, the 2380's Slide-Beam feature allows you to instantly change the pattern from narrow to wide. The light's battery pack recharges on-board via micro-USB. It can also run on two CR-123 disposable lithium batteries. An indicator light ensures you won't be caught by surprise with a depleted battery. Settings include high, low, and strobe. At its high power setting, the flashlight delivers 305 lumens for a maximum of 3.5 hours, and at its low power setting 30 lumens for a maximum of 25 hours. The tailcap switch offers constant-on and momentary modes, and a removable high-carbon steel clip provides carry options. The housing of the 2380 is lightweight but durable aluminium with a Type II anodised finish.